Living on Less Money: The Joy found in Serving (in our new Home)! The Joy found in Serving (in our new Home)! It's been over a month since my husband and I accepted a job as a caregiver to a 90 (just turned 91) year old woman named Alice. The opportunity came suddenly but as time has gone on I marvel at how perfectly suited this situation is for our current needs and smile knowing that God handpicked it for not only Alice but my husband and myself. To be honest with you I panicked the week before we were scheduled to move. I kept thinking.. what if I can't make Alice happy.. what if she doesn't like me...? My husband reminded me that the Scriptures never command us to make someone happy.. only to serve and love them. I married a smart man! So, here we are a month later and I can honestly say that my fears were unfounded. God has exceeded my expectations in the gift He has given me in Alice. She has not only opened her home to us but her heart. She has made us feel welcome and like we're part of her family. She doesn't treat me like an employee but as her friend. I'm finding great joy in serving her and making her comfortable. Honestly, it's been easy to fall in love with her. It blesses me so much when I ask her if there is anything else I can do for her and she simply says, "Nope. I'm happy." I'm a planner.. sometimes to my discredit. This past year I thought through a multitude of possibilities of where we might live next. I imagined us living in everything from a motorhome to my mother's house. Moving into Alice's home and caring for her was no where in the plans. I wasted a lot of time in 'over thinking mode' when I could have been using those moments worshiping God and serving others. It won't be time wasted though if I can learn from it. I find that recently when I begin trying to micro-manage my future I suddenly remember how amazingly God orchestrated this move and immediately I am reminded that God does a much better job of taking care of my future than I do. I am learning to 'rest' in His sovereign hands. Alice and I are settling into a routine and our days are beginning to establish a hum.. a rhythm. I'm learning her needs and how to make her comfortable. Before I moved in I set up a housekeeping schedule for her home. The first Monday after we moved here I pulled out my schedule and began cleaning. Alice said, 'what are you doing? Why don't you sit down and relax? Nothing needs to be cleaned.' Alice has kept a very neat and clean home but she is teaching me (slow as it may be on my part) that a person doesn't always need to be busy. I could learn a lot from Alice... and I'm sure I have much more to learn. I'm also learning some new lessons in frugality that Alice is teaching me. I'm learning how to clean less and thereby use less water, cleansers and electricity.. to wash less loads of laundry each week and to use less lights and water. These are great lessons that will help stretch our income if we're ever given the opportunity to live in our own home again. I am continuing to learn deeper lessons in loving God and others. There is joy in serving. Jesus came to serve... and not to be served. He gave His life as a ransom for many. I don't serve perfectly. I've had moments where I'm tempted to put my own needs first. I've struggled at times with the changes my life has taken over the past few years as my husband's disability has kept us closer to home and more isolated. But.. in spite of these lapses of giving into my selfish nature I am finding a renewed love for the One who was the ultimate servant as I learn to follow Him in serving others and putting their needs ahead of my own. Are you learning the joy of serving others? Is there a widow in your family that needs your help? Or possibly an elderly neighbor? Oh my yes. My mom needed my help a lot over these past several years. Unfortunately living far from her and not being in the best of health myself, along with her critical care needs, often made for an overwhelming situation. I just did the best I could and prayed about the rest. Thankfully she is now in a care home for critical needs seniors. She's only been there a month but seems to be enjoying herself; especially when volunteers drop by to sing and minister. She has really missed the fellowship of church and other believers for many years now. In nursing homes it is much easier to meet other Christians than when you are housebound. I'm grateful that she has this opportunity. How marvellous too that you've met a wonderful woman in Alice. A woman with lots of experience to share with someone like you who is ready to learn. God bless you and your husband as you minister to Alice's needs. What a wonderful blessing for you and for Alice. I am so pleased that this is working out so very well for all involved. And, thank you for your post, it spoke to my heart. You're such an inspiration and a beautiful child of God. You really inspire me with your faith, unselfishness and your positive attitude. I love the statement your husband said,'the Scriptures never command us to make someone happy.. only to serve and love them.' You certainly did marry a smart man! Alice looks like such a young 91 yrs...a very sweet looking lady. Serving each other is so beautiful. I am happy for you with your new situation. It sounds like God is seeing to all of your needs with each other. I'm in a similar situation right now. My husband and I sold our home in anticipation of moving across country and instead of finding an apartment, my sister opened her home to us. So she is serving us with love. And in return, we are helping her sort, pack and move her house so that she, too, can move cross-country with us. So we are serving her. Being interdependent and meeting each other's needs is so different from the world that when God is working it really stands out as a shining light. Until just recently I was helping to care for my 103 yr. old granma. (She just passed away in Dec.) Granma was able to still live at home with my mother as her primary caregiver. Someone had to be with her 24/7 so I helped out when my mom had to be out. Granma was always so appreciative for the littlest thing--it was a joy & a blessing to be able to help her. What an encouraging post! Isn't it wonderful that even though we may have been a Christian for many years, God still is teaching us as we are teachable. i have been in the classroom much lately and have learned a lot at His knee. Thank you for dropping by my post http://snapthatpenny.blogspot.com/2011/03/heart-for-pokot.html and leaving a comment. I didn't know what RYC meant ;-) I did want to say that yes, it is possible to enjoy living in a retirement home. So often the elderly are very lonely and alone. No one wants to take time to listen to them and help them. So it is great when you have an attitude of service toward Alice since too often people do not serve the elderly in this way even though they are in their own home. For years mom had help coming in but it wasn't a live in situation and she was always lonely. She is too busy now to even phone me as she has people coming and going. She loves that aspect of things and they take care of all her medical needs also. 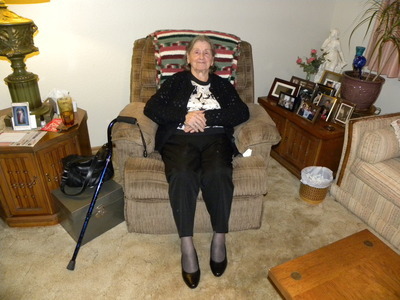 She really didn't want to go a nursing home but in the end, when she knew it was time, she did accept it and she is now making the best of it. That is part of the challenge, the acceptance. I also have an uncle in another city who has been living in a nursing home for several years. He has been telling mom how much he enjoys it to living on his own. This is such a lovely post. I'm glad it is working out so well for you to live where you are. We did this for three years when my husband was in school and it was a wonderful provision. I think Alice has a lot to teach us all. I tend to think i need to be busy all the time and constantly have "the next thing" to do. Sounds like you're in for a wonderful experience. I bet Alice loves having you around. Before my fil passed away, we had a nice lady named Barbara who was a big help. She came by their home every day to be sure they were taking their meds, eating, etc. After my dad in law died, my mom in law moved in with my husband's brother, but Barbara sure was a blessing when we had her. There is a special place in heaven for caregivers, IMHO. BTW, thanks for visiting me. I'm sorry I don't have an easy knitting pattern for socks, mostly because the socks are crocheted, LOL! But if I were you, I'd just get really good at knitting easy things first. Then I'd Google "Free Knit Sock Patterns for Beginners." You might be surprised at what you'll find out there! Wow, she doesn't look 91 at all. How does this caregiving arrangement work? Do you have time off? Really loved this post! thank you! I especially loved your husband's reminder about serving and loving--and that it isn't the same thing as making someone happy-- none of us can do that--it is a gift when it happens. I missed this post when it came out because we were out of town--camping without WiFi. It is just like the LORD to creatively work things out for our growth and His glory. I just love the contentment of you and Alice. Lots to learn here from you.